Thank you all for your loving words. Yesterday was a rough day and we pretty much stayed at the hotel watching movies and napping. Late last night we met with the doctors to look at next steps. Together we came up with a good plan and we hope to try again soon. This is not the story we had hoped for but heck, none of this story is ideal. Dr Yash mentioned how God tests the strong and Mark commented that he forgot to study for this test! The irony and comedy of my Markie is amazing. For those of you who know us, you know we are not easily defeated. Time does help to heal the wounds and we just need to take each day and continue to love each other and the idea that one day, we will be parents. Sadly we received the devastating news last night that the dreaded caps coming off our vials in shipment ended up being the worst thing ever. Not one of our twelve embryos were there. I imagine they were all on the floor of the tank, destroyed. The doctors were amazingly supportive and equally devastated. We have options still down the road, now though we need time to cope with this disaster as heartbreaking as it is. Today was another exciting day in Mumbai. I woke very late as I did not sleep most of the night, and Mark was up for hours before me. He has adjusted to the time change better than me for sure. We decided to order food into the room for breakfast and have a lazy morning. Shortly after ordering food we got a call from Dr S about out plans for the day which was a pleasant surprise. We arranged to have Ajit the driver pick us up, so we ate our huge breakfast of eggs, cereal, fruit bowl and toast and donuts and coffee...it was a huge amount of food. While we ate Ajit called to tell us he would be here shortly so we hurried up and got ready. Shortly after this we headed with Ajit to Hirandani Hospital. This hospital is located in an exclusive part of Mumbai in Powai Lake area. We went to the ultrasound area to find Dr Yash and Dr Sudhir there with two surrogates and a baby. They were babysitting for Chaya today. We had a chat with them and then Adam and Stephanie came out from the u/s room glowing from the sacn of their baby. They had taken a few screen shots of the 3d ultrasound and they seemed overjoyed. 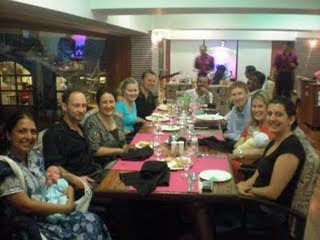 We all went to meet Dr Soni the obgyn who cares for the surrogates. Adam and Stephs surrogate was there and she looked amazing, She is such a tiny woman!! To much surprise after Dr S examined her, they found out she is dilated 2.5 cm and she was admitted to hospital. So we may get to see a new baby any day now! We were then asked if we would like to go to the SI cinic and meet Reshma!! We were surprised for sure, as we did not expect to meet our surrogate today. We took the long trip to the SI clinic..which is probably only long due to the traffic chaos! Once at the clinic we all had a drink together, and shortly after Reshma was brought to meet us in the office. It was overwhelming..what do you say to this woman who will hopefully carry your baby! We told her she is a blessing and asked how she is doing. The waterworks turned on twice for me as I got caught up, overwhelmed. We took a few pics with her and has a quick tour of the SI clinic, said goodbye to Reshma and made our way back to the Vits. For those of you wonderng about the Vits, the hotel is great. It is very clean and Internet is fast!!! The food in the hotel is great as well. When we got back to the hotel, Amit was waiting for us, He so kindly took our CDN money last night and had it all changed to INR. He met us in the lobby with a huge wad of cash, 23200 INR looks like a mafia amount of money. Its the savings we made on moving hotels as well so we cannot complain. We had a quick chat with Amit out side then came back to the room to cool off. We spoke with Carrie Jo and went to have a visit with her and Shawn and baby bella. While we were there they got a call from Dr S about some paperwork so they had to pack up and head out. Carri Jo and Shawn are at their wits end with the required or not required but suddenly needed paperwork for the exit visa for Isabella. They are taking it in stride but have had enough and hope that tomorrow all gets settled and they can leave very early Thursday morning. We ventured out to eat at an outdoor cafe restaurant...testing the Delhi Belly waters for sure. The place is all vegetarian and we did enjoy it. Its now 3:19 am here and I am wide awake. I should go back to bed and see if I can rest. 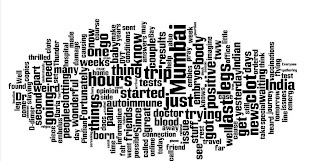 Tomorrow we are headed to South Mumbai where the bombings took place last year. We will shop and eat there and probably spend the most of the day there. It takes about 1 hour to get there so back in the car we go! So now its 11:30 pm and we are going to try to rest. Tomorrow we will spend the afternoon with the doctors who will reach us on the cell phone they gave us this evening. Will try to update the blog tomorrow. Next post will be live from Mumbai! We leave in 5 days and are whirling! For the last month I have barely slept with anticipation, similar to a kid at Christmas. Our surrogate is scheduled for a u/s this Thursday to see how she is progressing and if all goes well, our FET will be July 28/30. This is so real now. We are in a constant state of internal chaos. We have waited so long for this to happen and now it is smack dab in front of us. It is very surreal - almost unreal. The weekend was busy getting ready for the upcoming trip and events. We think we have everything we need and can only imagine how the couples going for baby pick up must feel. We are only prepping and packing for us and it feels a bit of a task. The thought of possibly being pregnant in 3 weeks or so is one I can think of, but somehow my body/mind is protecting me big time from truly absorbing this. The human body is truly amazing. When we go into high stress situations the body works in overdrive to protect us. I am having a hard time explaining myself here, but I sure you know what I mean. I guess I can best describe it as shock. CJ and Shawns little girl was born last week and we are all waiting on updates (hint hint). Chaya and hubbie and son are chilling in Mumbai waiting on all the paperwork to come back home to Canada, and Daria should be resting now after egg retrieval earlier this morning in Mumbai.For those I have missed I apologize, but please know you are all in my thoughts. There is always lots going on in this crazy surrogacy world. Its a blessing for sure to be in the loop of this circle. I also see that the ducks had a baby shower over the weekend and the cake looked amazing! So, this week will be full of heightened anticipation and wonderment. This journey as you know is not easy, and I do not expect it to get any easier as we get closer. Taking it is stride is all we can do. Inspired by Jojo and curious what would come of wordling my blog here it is.. When stress reaches it's climax! On Friday we received the news that our embryos were at Lilavati! Whew, great news right? Well the second set of news was that the caps on 3 of the 4 vials had fallen off during shipping and we did not know the status of the embryos. Can you imagine the shear devastation we felt? When I got this news I did almost physically vomit. This is the worse case scenario (other than the embies thawing on route). Fortunately the wonderful team we have aligned ourselves with have been very busy trying to help us throughout the weekend. We have heard from Canada and India that the best guesses are that there is minimal damage if any but we will not know until we thaw. So, our black cloud reigns supreme yet again. We are now just keeping the faith and staying as positive as possible until we know the true outcome. Have just heard from India that the embryologists feels the embryos are still in good shape and this indeed gives us hope. We blame no one for this as it is just one of those things that happens, and unfortunately to us. These are the types of days that I wish I was a drinker! Fortunately Mark and I are rational and logical and take time to assess the situation. Thanks to all the docs for taking care of us over the last 36 hours and working hard to get us answers. Now the rest of you must say a little prayer for us and our precious embryos. We leave in 16 days!! Finally it is here and we are so excited. Despite my legs acting up we are trying to organize ourselves for the visit to I N D I A! I am off to the Naturopath on Saturday for his thoughts and treatment on my leg issue. I also got a script for compression stockings for my clotting issue on the long flights. I am going to ask the naturopath about Malaria and Typhoid. I had dinner with my Pindian friend (I say Pindian as he was born in Pakistan , married an Indian girl and has converted to all things Indian). He mentioned the vaccinations and I of course refuse to vaccinate. You may think I am crazy but I believe my autoimmune issue and many out there are caused/triggered by vaccinations. After years of suffering with autoimmune issues the last thing I need to do is add more toxins to my body. Ok, enough of my vaccine rant. So other than the questions of staying healthy, we are trying to ensure we have all we need. We have copies x 5 of our passports, Visa's and marriage certificate. We have the docs numbers printed off and copies of our legal doc. I am not sure what else we need to take so I am calling out to my surro friends to let me know what we are missing. 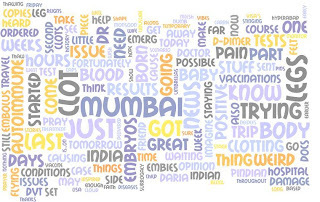 Our embies should hit Mumbai today or tomorrow, and we just pray that they arrived safely!!! Today Chaya's baby should have been delivered by c-sec and I am dying to hear the updates!! A set of Twin boys were born earlier this week in India and seem to be doing well despite been born a few weeks early. When we land in Mumbai we will meet with couples who are there anticipating baby arrival. We are thrilled to be part of this (not a huge part but part). Nik and Lisa, Stephanie and spouse and Carrie Jo and Shawn will all be on pins and needles waiting for babies while we finally get started trying to make a baby. Rhonda and Gerry are not far behind and sadly we will not see them in Mumbai at the same time as us. Daria leaves tomorrow for Mumbai and our trips will not overlap...nothing but positive vibes for Daria!!! Ocho should be in the tww and we pray again for a positive. Johnny and Darrens trip overlap with ours and they will be in the same stage as us..thank goodness we will have someone to swap stories with. The monsoon season should make this trip even more fun. We have two travel size umbrellas just in case. My friend Nilesh will come to see us from Hyderabad which is quite far from Mumbai. I am really looking forward to seeing him and hopefully he will bring his little son and wife. Please email me of post here what you think is a necessity for the trip especially on the surrogacy side. Have a great day! I spent the bulk of yesterday in emergency. Since egg retrieval I have not been feeling great and last week I started getting weird stuff happening. My feet go numb and cold and my hands tingle. A few days after this started I got some pretty intense and weird calf pain. The pain has complimentary issues like stinging and zinging in my legs and unusual sensations. Dr M sent me to emerg to have this checked out as he fear DVT - thrombosis - blood clots. He also said if this is found there will be no flying for me in the near future. So of course I went into a PANIC!! Here we are 3 weeks away from going and it could all come to a hault. So I got myself settled in at hospital and the doctor ordered a D-dimer test and other tests to screen for clotting. After a few hours the results we in an I show no signs of clotting based on the screening results. As this is some relief to me I still have the leg stuff going on. The doctor at emerg felt it could be a side effect of the drugs or a hormonal thing as my body gets back to normal or a viral infection that is causing this weird stuff. The hospital gave me all the test results and I sent these off to Dr M last night for a second opinion, and one that understands my health history. So today I am off to work and waiting for Dr M to give me his opinion. Why is nothing easy! Sheesh! I imagine now flying for 19 hours with these legs!! Hopefully this is a temporary thing and will ease off in the next three weeks. Considering I am an autoimmune poster child I am not optimistic that this will go away quickly. D-dimer tests are ordered, along with other laboratory tests and imaging scans, to help rule out, diagnose, and monitor diseases and conditions that cause hypercoagulability, a tendency to clot inappropriately. One of the most common of these conditions is DVT (Deep Vein Thrombosis), which involves clot formation in the deep veins of the body, most frequently in the legs. These clots may grow very large and block blood flow in the legs, causing swelling, pain, and tissue damage. It is possible for a piece of the clot to break off (this broken piece is called an embolus) and travel to other parts of the body, where the clot can cause a PE (Pulmonary embolus or embolism - blood clot in the lungs).